Brookside Stables is a beautiful farm situated in Victoria, BC. Brookside is a full service facility which specializes hunter/jumper and equation, also offering lessons in dressage and natural horsemanship. We offer lessons for beginners to advanced riders of all ages. All disciplines are welcome to join our family atmosphere barn. 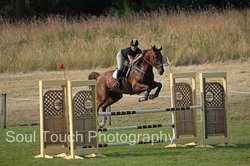 We offer training, boarding, leases, and lesson programs as well as horses and ponies for sale. If you are a competitive rider looking to show or a pleasure rider you will be welcome at Brookside. We have miles of trails including Beaver/Elk lake one direction, and Durrance lake the other. Come join our team! In loving memory of "Bru" the best barn dog around.